As early as 1955, the Maryland State Roads Commission (SRC) designed plans for an outer beltway to supplement the Baltimore Beltway (I-695) then under construction. What eventually became MD 100 was the southern arc of the proposed outer beltway. In anticipation of significant population growth between Baltimore and Washington, the SRC decided to build the southern arc of the outer beltway first as a link between US 29 (Columbia Pike) in Ellicott City and MD 177 (Mountain Road) in Pasadena. The 1964 Baltimore Metropolitan Area Transportation Study proposed the route as the "Dorsey Freeway" as it was to relieve congestion on MD 176 (Dorsey Road) through Anne Arundel County. THE MOUNTAIN ROAD BYPASS: Work began on the first section of MD 100 in 1963. The 3.7-mile-long section originally was called the "Mountain Road Freeway" because it connected Mountain Road with the Glen Burnie Bypass (now I-97). Indeed, this section initially had the MD 177 designation because it was an extension of Mountain Road. The short section of four-lane freeway was completed in 1965 at a cost of $2.4 million. Upon its completion, the short freeway provided a bypass for Annapolis-bound traffic traveling from the Glen Burnie Bypass. The ramps for EXIT 13 (MD 174 / Quarterfield Road) and EXIT 14 (Oakwood Road) did not open until after the highway opened. SECTION BY SECTION, ROUTE 100 TAKES SHAPE: The Mountain Road Freeway was conceived as the initial section of the Baltimore Outer Beltway. The Outer Beltway was a lightning rod for controversy not only along its western and northern arcs (which it not survive much beyond the initial design stage), but also through the southern arc through Anne Arundel and Howard counties. This explains the slow progress of construction over the following 35 years. 0.7 miles from I-95 to US 1 (Baltimore-Washington Boulevard) in Elkridge: This six-lane freeway opened with the completion of I-95 in 1971. It originally ended at a partially completed, grade-separated interchange. 4.3 miles from MD 2 (Ritchie Highway) to MD 177 (Mountain Road) in Pasadena: This four-lane route was built mostly as a freeway on a six-lane right-of-way except for signalized intersections at MD 607 (Magothy Bridge Road), Magothy Beach Road, and MD 177 (Mountain Road). A wide center median was reserved for the then-unbuilt Arundel Expressway (MD 10). When MD 10 was extended south during the late 1970's, a short overlapping section of MD 100 was widened from two to four lanes in each direction. Despite the $55 million allocated for the completion of MD 100 (according to the 1972 statewide highway plan), most state highway funds during the 1970s were diverted to the completion of Maryland's Interstate highway network - particularly within Baltimore city limits. Given increasing budget restraints and a growing shift among officials to favor mass transit projects, the state shelved plans to extend MD 100 west of I-95 in 1974. REVIVING MD 100 WEST OF I-95: By the end of the 1970s, the Baltimore Outer Beltway had been dead for several years, but officials in Anne Arundel and Howard counties persuaded the state to revive plans to extend MD 100 to serve rapidly developing communities in the Baltimore-Washington corridor. The missing links of MD 100 were added back to state plans in 1979. One key figure in reviving MD 100 plans was Elizabeth Bobo, who as citizen activist fought plans to extend MD 100, but as Howard County Executive in the 1980s supported construction of the freeway to relieve congestion. Another key figure was Valerie McGuire, an Ellicott City day care provider who--on her kitchen table--developed the "S" alignment that saved a number of townhouses in the Hunt Country Estates development. After more than two decades of funding squabbles and environmental studies, the Maryland Department of Transportation received approval and $180 million to complete the two missing links on MD 100. Construction of these missing links--a 5.4-mile-long, six-lane segment extending west of the existing terminus from I-95 to US 29 (Columbia Pike), and a 7.5-mile-long, four-to-six lane segment connecting the two existing but separated MD 100 sections from US 1 (Baltimore-Washington Boulevard) to I-97--began in 1994. 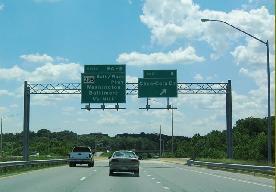 Interchanges along the newer sections of MD 100 were characteristic of those built in the area: one interchange connected to a mass transit facility (EXIT 7 / Dorsey-MARC rail station), another interchange was built as a single-point urban diamond, or "SPUI" interchange (EXIT 11 / MD 170), while small roundabouts were built at the ends of some ramps where they intersect with local roads. MD 100 took over the right-of-way of Dorsey Road (MD 176) in the area of the interchange with MD 295 (Baltimore-Washington Parkway), requiring the reconstruction of that interchange. Greater attention was paid to environmental sensitivity during this period of construction on MD 100. Ten acres of wetlands were created to replace the five acres lost during construction. 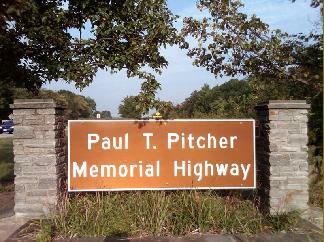 The 22.1-mile-long Paul T. Pitcher Memorial Highway was completed on November 23, 1998, providing a critical east-west link in the busy corridor between Baltimore and Washington. The newly extended MD 100 was renamed in honor of Paul T. Pitcher, a former county executive and circuit court judge who served Anne Arundel County in the 1950s and 1960s, and who conceived the highway that ultimately bore his name. Pitcher's son, William, later served as a lobbyist for the Maryland Asphalt Association. PLANNING AN OUTER BELTWAY: With work well underway on the Baltimore Beltway (I-695) and the Capital Beltway (I-495) in the late 1950s, officials at the Maryland State Roads Commission already were planning for the distant future. To accommodate traffic growth years in advance, the SRC planned outer beltways for Baltimore and Washington. Beginning at the end of the existing US 29 (which was rebuilt as a six-lane freeway during the 1980s), the Outer Beltway was to have extended north toward I-795 (Northwest Expressway) near Reisterstown. The Outer Beltway was to have veered east toward I-83 (Baltimore-Harrisburg Expressway) near Hunt Valley and I-95 near Gunpowder Falls State Park. Just beyond US 40 (Pulaski Highway), the Outer Beltway was to have turned to the south and west toward MD 702 (Southeast Expressway) in Essex and I-695 (Baltimore Beltway / Patapsco Freeway) in Dundalk. The freeway was to have had four lanes (two in each direction), but built to accommodate an additional travel lane in each direction. It was designed to carry 30,000 vehicles per day by the late 1980s. No timeline was established for completing the $100 million Outer Beltway, which was to have incorporated present-day sections of MD 100 and US 29. No known designation was given to the Outer Beltway, though it is likely it would have received the MD 100 designation because there is no record that the state applied to the Federal Highway Administration for Interstate funds. (Similarly, the Washington Outer Beltway likely would have received the MD 200 designation, though the MD 200 designation now is being used for the Intercounty Connector, itself a remnant of outer beltway plans.) Much of the Baltimore Outer Beltway was canceled amid heightened environmental regulation and local opposition in the early 1970s. BUILD A NEW EXIT 21: The existing signalized intersection at MD 607 (Magothy Bridge Road) should be replaced with a grade-separated, partial-cloverleaf interchange. Just east of the new EXIT 21, an overpass should be built to carry Magothy Beach Road over MD 100. SOURCES: "Map of Future Expressway System," The Baltimore Sun (12/14/1955); "New DC Road Is Planned," The Baltimore Sun (11/28/1961); "Glen Burnie's Bypass Open," The Baltimore Sun (5/28/1965); "Freeway Eases Traffic Through Glen Burnie" by Lawrence McDaniel, The Baltimore Sun (7/09/1965); "20-Year Highway Needs Study," Maryland State Roads Commission (1968); "State Primary Highway System," Maryland Department of Transportation (1972); "State Plans New Route 100 Extension," The Baltimore Sun (3/01/1979); "County Officials To Decide on Route 100 Plan" by Molly Sinclair, The Washington Post (7/22/1993); "Final Leg of Route 100 Opens in Howard, Connector Links Route 29 and I-95" by Craig Whitlock, The Washington Post (11/26/1998); "Maryland 100," Asphalt Paver-Maryland Asphalt Association (Spring-Summer 1999); Alex Nitzman; Paul Pitcher; Mike Pruett. MD 100 shield by Mike Pruett. MD 100 exit list by Wikipedia.